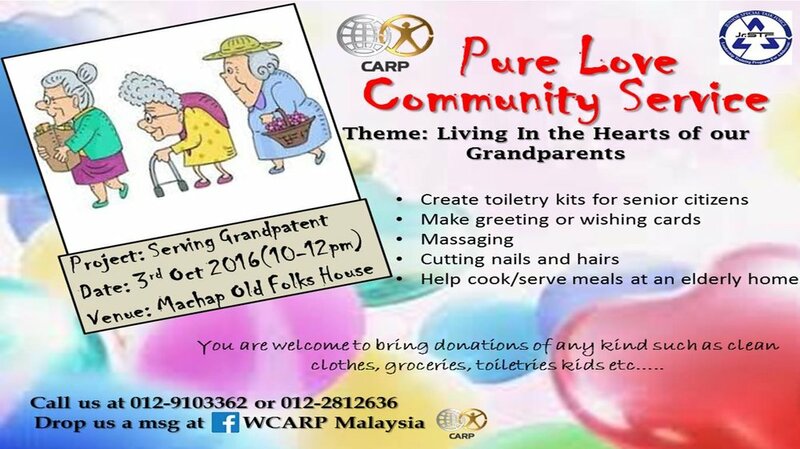 On October 3rd, 2016, CARP Malaysia organized a “Pure Love Community Service Project” with the theme, Living In the Hearts of our Grandparents at the Machap Old Folks House. There was a total of 31 volunteers including young people, parents, guests, and missionaries. Some people also brought along their entire family to join in this service project creating a nice, warm atmosphere. The main purpose of this service project was to serve and bring joy to the elderly in the community. There were many other possible projects, but this service project with the elderly was chosen because it would give those involved a chance to grow their capacity to love and serve people who are like their very own grandparents. Many times, we live far away from our own grandparents but don’t realize that we have many other “grandparents” around us. This project was a good opportunity to build upon those relationships. This was a great project but it was not without its challenges. We were challenged by the generation gap, cultural shock and difference in mind-set. The volunteers, however, took those difficulties very graciously and did their best to overcome them. They tried to invest fully in loving the elderly and uniting as one. The volunteers brought a smile on every face with their energetic cultural performances showcasing their talents in dancing and singing. Many of the elderly clapped along and were deeply moved by the performances. The volunteers also massaged their “grandparents” and cleaned the Old Folks House. It was a good experience for the participants to put into action the phrase they had so often heard, “live for the sake of others.” They found that true happiness came from serving others and making others happy. CARP Malaysia is already preparing its next service project; going to the underprivileged children’s homes to bring joy to their younger brothers and sisters. Thank you CARP Malaysia for spreading joy and love to your community!